From ABC News: "An al-Qaeda threat prompts closing of 21 US Embassies." State Dept. spokesman Harf said " that the embassies would be closed specifically on Sunday, with an assessment afterwards on whether to reopen them. “It is possible we may have additional days of closing as well,” The State Department has also issued a travel alert to those countries for one month. Update: The state department has announced that the closures of these Embassies will last for at least one week. These Embassies and consulates are all in Muslim countries. 1. President Obama was either very wrong or he purposely lied to the American people when he has said over and over and over again that al-Qaeda has been decimated and is on the run. This unprecedented closing of all these Embassies in the Muslim world, and this unprecedented travel warning issued to Americans to these countries for at least one month, does not lend itself to president Obama's proclamation that al-Qaeda is on the run. 2. I am not criticizing the move to close the Embassies in just Muslim countries, but this does show that sometimes racial profiling is a legitimate tool to use. They closed the embassies and are restricting travel to countries that would be the most obvious to be under attack-those in the Muslim world. There was not one Embassy in a non Muslim country that was closed. That is a legitimate use of racial profiling. Shouldn't they extend that racial profiling to stop allowing immigration to the United States [at least while the threat from Muslim terrorism still exists] from young Muslim men from those countries? The only way, in my opinion, they could open back the embassies, would be if they found out the chatter was not really as legitimate as they first thought [like in the US when there is a bomb threat and buildings are evacuated, but the people can return to the buildings when they determine that threat was not real]. The other way the embassies could be opened and the travel restrictions be ended is if they kill or capture all those involved in the chatter that called for the attack. Other than that, if this threat is really as significant as the State Department is saying to take this unprecedented action, I don't see how they can lift travel restrictions to those countries and put Americans in danger. I think the question that must be asked when they do open the embassies and ease the travel restrictions, 'what makes the threat that was so serious the day of the closing, not as serious of a threat on the day it is opened?" One other point. I hear many people now criticizing those who attempt to restrict the NSA's gathering information of Americans phone calls [and I am not even saying I am one of those people-as I am conflicted and still undecided whether it should be limited] by saying that this action by the US proves how successful the NSA program is and how every aspect of it must be maintained. What? Are you telling me, the bulk gathering of metadata from calls made by Americans, was used in uncovering this plot by Al Qaeda? I do believe information was gathered by the NSA from foreign sources, and I am totally in favor of that, and that absolutely should be continued [and to the phone calls made between those foreign entities and Americans] but I believe the gathering of metadata from Americans phone calls had absolutely zero to do with uncovering this terrorist attack threat. That is not an argument against the gathering of all Americans phone call records, but all I am saying is this episode doesn't prove the need for it. Excellent Point. And I just wonder why this government is out and out saying "Chatter is HIGH"?? Don't the so called Terrorists get a big warning on this? Or is this just they ALL know a disruption in the Middle East has ALWAYS been imminent. 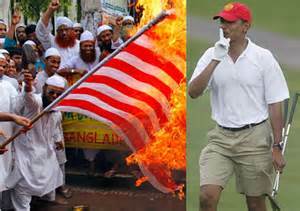 As the current President just plays golf and ignores the wish of America. I believe he has ALWAYS had an agenda. To Necessarily change our customs and way of the Constitution. I sure wish they would have heard the "chatter" when Ambassador Stevens was begging for help-telling them of impending danger. They seemed to miss that chatter-or didn't give a damn.